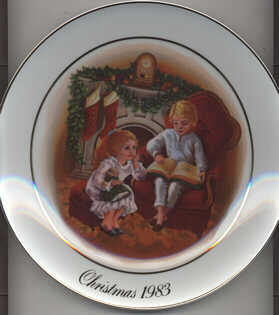 THIS IS A 1983 THIED EDITION AVON CHRISTMAS MEMORIES PLATE. NO BOX, BUT EXCELLENT CONDITION. BOY READING TO LITTLE GIRL. CHECK OTHER AUCTIONS FOR MORE AVON CHRISTMAS PLATES. COMBINE ON SHIPPING. HIGH BIDDER PAYS SHIP/INSUR. ENJOYING THE NIGHT BEFORE CHRISTMAS 1983 AVON CHRISTMAS MEMORIES PLATE This is the third in a series of porcelain plates continuing Avon's Christmas tradition. Trimmed with 22K gold. The plate is in mint condition. The scene shows two children sitting in front of the fire reading, with stockings hung and a mantle decorated with christmas greenery. The colors are bright and beautiful. The gold trim is in fantastic condition too! No chips or cracks. No scratches that I can see/find (and I've looked hard!). This plate comes in its original box, with the original styrofoam packing. The styrofoam is in tact and the dark green original box is in good condition too (except for a little wear at the box's corners). US BIDDERS ONLY PLEASE! High bidder prepays bid plus priority postage and insurance. Payment to be received within ten days of auction's close or sale is void.